To Advance Science in Reproduction, Fertility, and Development Benefiting Humans and Animals. A Sustainable World Through the Science of Reproduction, Fertility, and Development. The Society is an association of scientists and physicians interested in research in reproduction. Some members are engaged in basic or applied research, while others perform clinical practice. All are dedicated to advancing knowledge of reproductive processes in animals and in humans. Members are affiliated with colleges and universities, medical and veterinary schools, medical centers, research institutes, government agencies, and industry in countries around the world. SSR members have made key contributions to stem cell biology, transgenesis, treatment of infertility, contraception, livestock production, pregnancy health, treatment of reproductive system cancers, and identification of environmental contaminants. Our members are internationally recognized. They include members of the U.S. National Academy of Sciences and recipients of the Lasker Award, the Wolf Prize, the Grand Prix Charles-Leopold Mayer, and the International Prize for Biology. Holding annual meetings at which scientists present data, learn the latest information in their field, and meet fellow scientists. Publishing Biology of Reproduction (BOR), the number one journal in this area of research. Informing its members of current political issues related to science: research funding, animal use, ethics, etc. Speaking for its members at the national level, primarily through its association with the Federation of American Societies for Experimental Biology (FASEB). Visit our history page for historical photos from the SSR archives. 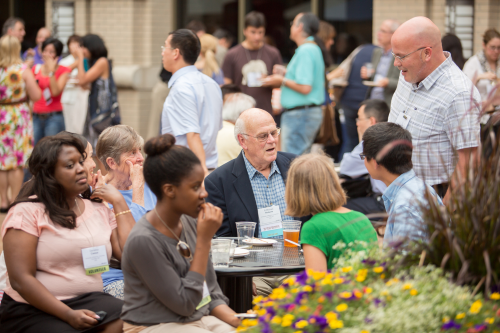 Attendees at the Opening Reception of the 2014 SSR Annual Meeting in Grand Rapids, Michigan. SSR provides its members many such opportunities for networking with colleagues in an inviting environment. "I have loved the openness and non-elitism of this society. I was its first female president in 1974, and I have been followed as president by many other women. Not surprisingly, the Society has also welcomed trainees, giving them travel awards and prizes for excellent papers and places on the governing board. The annual SSR meeting was always the favorite yearly science event for me and my trainees." "The Society nurtures and supports young scientists and research trainees by giving them unparalleled opportunities to present their work and interact with the best scientists in the world that focus on solving important problems in reproduction. The scientific research conducted by the members of SSR is outstanding and unequivocally necessary to improve reproductive health and welfare of animals and humans." — Thomas E. Spencer, Ph.D.